In the quest for sustainability, we strive to meet our present needs without sacrificing the same opportunity for future generations. Our success or failure depends on our ability to think in “systems,” integrating environmental, social, and economic considerations. But how do we learn systems-thinking? In a series of engaging, rapid-fire stories, Sustainability through Soccer takes readers on a journey through a progression of systems-thinking and sustainability concepts. 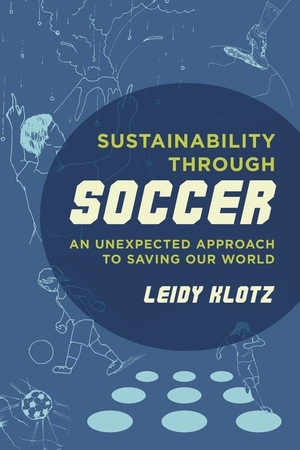 Using the beautiful game of soccer as an analogy, Leidy Klotz illuminates real-world interdependencies (such as between climate change and human rights), building the chain of concepts in a fun, accessible way. Soccer nerds and newbies alike will be entertained on the way to a deeper understanding of sustainability science. Leidy Klotz is the Copenhaver Associate Professor at the University of Virginia. Less than a decade into his academic career, he has been awarded a prestigious CAREER award from the National Science Foundation and named to NerdScholar’s inaugural list of “40 under 40: Professors Who Inspire” for his ability to captivate and engage students. Before becoming a professor, he was a professional soccer player.